Love me tender banjo / mandolin sheet music tab. Recorded by Elvis. The tab is in the key of G and the beginners letter notes are included. There's an image showing what keys / notes to play on the piano. The second version of the sheet music is in the key of C Major. Love me tender mandolin / banjo tab by Elvis. 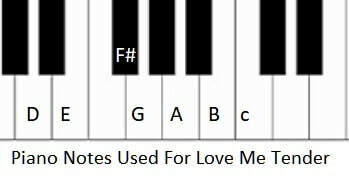 Love me tender - easy to play notes by Elvis.